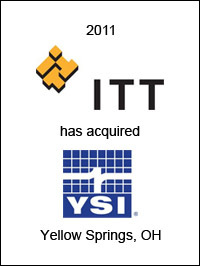 ITT Corporation (NYSE: ITT), White Plains, NY, has acquired YSI Incorporated (“YSI”) for $310 million. Based in Yellow Springs, Ohio, YSI is a leading developer and manufacturer of sensors, instruments, software, and data collection platforms for environmental water monitoring, with facilities in the US, Europe and Asia. YSI reported 2010 global revenues of $101 million. ITT Analytics is a leading manufacturer of premium field, portable, laboratory and online analytical instruments used in water and wastewater, environmental, medical, and food and beverage applications. The company’s meters, sensors, analyzers and related consumables are used every day by thousands of end-users worldwide to analyze and control quality in countless industrial applications where precise measurement is required. ITT Analytics’ products are sold under the globally recognized brands WTW, SI Analytics, OI Analytical, Royce Technologies, Aanderaa Data Instruments (AADI), Global Water Instrumentation, ebro and Bellingham & Stanley. 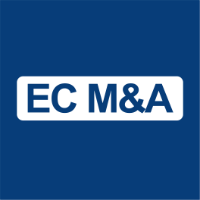 EC Mergers & Acquisitions acted as exclusive financial advisor to ITT on this transaction.